This article was originally published on the Tech Girls Movement website. Re-published with permission. Parts of this article have been adapted. Year 12 students from a WA school won the Tech Girls Movement competition in 2016. This competition is held annually, and encourages teams of students to find a community issue and come up with an app-based solution. The girls, also known as the Vocabulary Voyagers, decided to address the problem of literacy in society. They created an app full of fun games, activities and reading challenges to advance the spelling ability and develop vocabulary children in years 2–6. Following on from their success, Kira (one of the team members) facilitated a holiday workshop to promote coding to other students at her school. Below is Kira’s account of this workshop. A 4-day coding workshop during the summer holidays was offered to students in Years 7–10 [at St Marys Anglican Girls School in WA]. 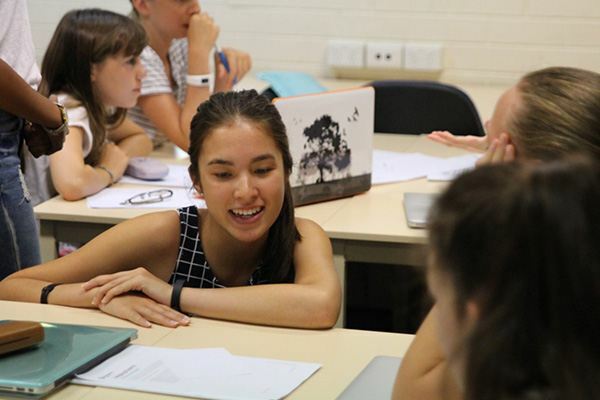 This was a student lead workshop run by Technology Captain 2017, Kira Molloy, with help from three Year 12 girls: Molly Brades, Sayalee Tak and Delaney Eastabrook, who gave up time out of their school holidays to assist. During this workshop, the students learned how to code an app, while also discovering important entrepreneurial skills such as pitching, writing a business plan, branding, and marketing. Industry experts from Avanade, Microsoft and Fogarty Foundation as well as inspiring women in STEM such as Lyn Beazley and Michelle Sandford also volunteered to help the girls and delivered insights into what its like to work in technology and the ever-growing importance that technology plays in our society. By the fourth day, the girls’ apps were impressive and you could see their excitement as the apps started to come to life. The girls have big goals such as putting their apps onto the Google Play Store, which is a goal I know they will achieve. The final day ended with a ‘pitch-off’ where each team pushed through their nerves and pitched their apps in an attempt to win first place — a waterproof and shockproof speaker each, kindly donated by Technology One — or second prize — a Selfie stick each, kindly donated by Avanade. The pitches were judged by experts from Microsoft and Avanade and a winner was chosen. Even though not all girls won they each walked away with other gifts such as pens, goodie bags and Frisbees, donated by Technology One, Avanade and the Tech Girls Movement. These girls have shown great potential and a weekly meeting will be held throughout the year so that they can keep developing their apps before entering them into the National Competition Search for the Next Tech Girls Superhero and later the global Technovation competition where if they are successful will accompany team Vocabulary Voyagers to Silicon Valley. We look forward to seeing what the girls produce in the next few months to come.